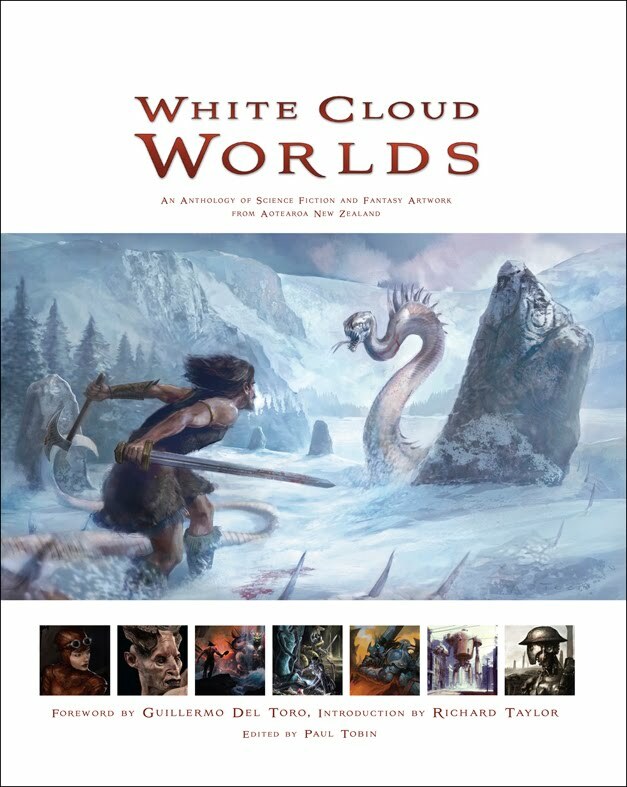 I feel lucky to be part of this book that will be coming out soon, called "White Cloud Worlds", which is an anthology of fantasy artists from and/or presently residing in New Zealand. I got my copy a few weeks ago, and it's truly a beautiful thing. There is a veritable crap-load of really talented people who get a chance to show their personal work that most people would otherwise not see. Personal work that includes a Howard Pyle-esque painting of chimpanzee pirates, a girl nonchalantly lounging on a sofa while giant caterpillars scale buildings outside her window, giant robots marching across a World War I battlefield, and more such innovative images. We were also really fortunate to have a foreword by Guillermo Del Toro, an introduction by Richard Taylor, and afterwords by Alan Lee and John Howe. Definitely check out the website for the book, which introduces the artists and previews some of the content as well. The White Cloud Worlds site also has info on an upcoming exhibition of work from the book, which will include a few of the sculpts that are on this blog. There's going to be a few signings of the book taking place in the next month or so, one at Armageddon in Auckland during Labour Weekend, one at Unity Books in Wellington on October 30th at 5pm, and a last one at the Weta Cave in Miramar on November 14th, 1pm. I'm planning to be at the latter two, so if you're in New Zealand during those dates and want to stop by, hope to see you there...! Congrats David! I just visited their site, and can't wait to pick up the book! Hey thanks a lot Norm-I hope you like the book! Hey David. Congrats on the book. I love your work, the stuff for district 9 the sculps and concept art , wow, they should give you a hug! Amazing man. I just started my blog and I'm looking to get my stuff out there. If you can check it out, I would value your opinion and advise. thanks again, your work rocks! Really fantastic work on here! I love all of the District 9 stuff you did too. So cool.